I lift weights and/or do CrossFit most weekday mornings. 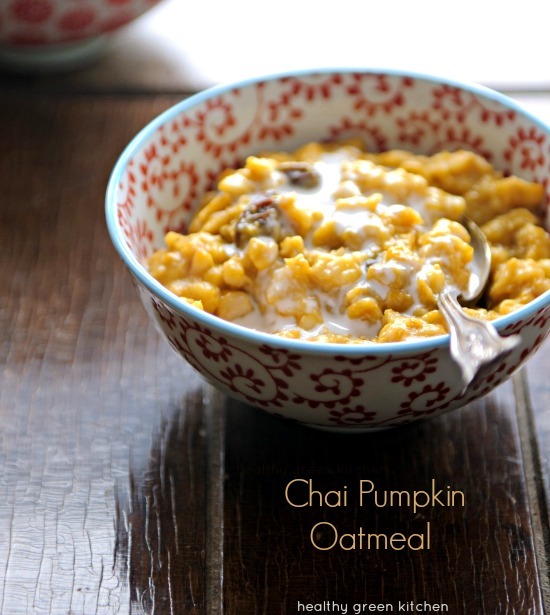 I like to get some nourishing carbohydrates into my belly before I head to the gym: I just love this recipe for Chai Pumpkin Oatmeal. This oatmeal is a wonderful autumn breakfast no matter what your morning routine is like; it comes from my friend Shelley Alexander‘s book Deliciously Holistic . Shelley is a holistic chef. She specializes in preparing healthy foods that nourish, strengthen, and energize, and her cookbook contains more than 150 recipes that are as yummy as they are good for you. I have an extra copy of the book to give away…more details on that at the end of this post. Oats are high in nutrients including B-vitamins but they contain naturally occurring compounds (phytic acid and enzyme inhibitors) that may make them difficult to digest and bind up some of their nutrients (this is the case with most, if not all, grains). For this reason, it's a good idea to soak the oats in a mildly acidic liquid (such as water mixed with a little lemon juice) before cooking in order to maximize their "digestibility" and to make sure you derive the benefits of the nutrients they contain. I don't always remember to soak my oats in lemon water, but it's a good practice to get into, especially if you eat oats frequently. To soak the oats for this recipe, place oats in a bowl. Add 1 tablespoon of lemon juice and cover with water by an inch or two. Stir the oats and the liquid together and cover the bowl with a cloth or a piece of plastic wrap. Allow to stand overnight. In the morning, drain the lemon water and proceed with the rest of the recipe. 1. In a medium saucepan, mix together water, coconut milk, vanilla, and sea salt. Bring mixture to a simmer over medium heat. Once coconut water is hot but not boiling, place the tea bag in and steep for about 5 minutes. Remove tea bag and stir in maple syrup, pumpkin, and drained rolled oats. 2. Cover and cook over medium heat for about 10 minutes, stirring occasionally, until thick and creamy. Remove from heat and spoon the oatmeal into serving bowls. 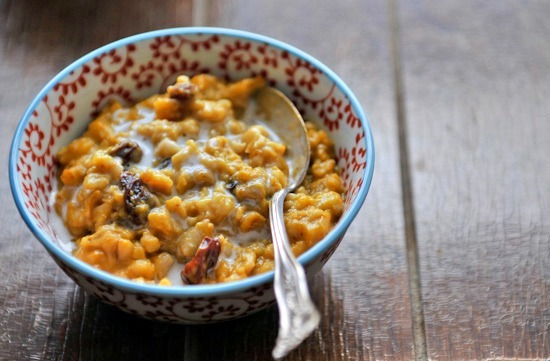 Top with additional coconut milk, mulberries or raisins, walnuts if using, and cinnamon. Taste and drizzle with more maple syrup if you prefer your oatmeal sweeter. Adapted just slightly from Deliciously Holistic: Healing Foods Recipes And Lifestyle Tips To Help Increase Your Energy And Immunity! . Shelley provided me with an extra copy of her book to give away to one of my readers. Please leave a comment below and you will be entered to win the book. This giveaway is only open to readers in the US and it will close on Thursday October 3rd, 2013 at midnight EST. Thanks and good luck! And to stay on top of other Deliciously Holistic giveaways and promotions, be sure to like Shelley’s Facebook Page! I could use more energy, especially with winter fast approaching! This oatmeal recipe looks delicious and is definitely a breakfast treat that I would love to make for my family. Oatmeal is both nutritious and nourishing. Thank you very much for this amazing giveaway!! I truly aprpeciate it! Yum!!! Pumpkin, chai, and coconut milk are three of my favorite things. What a GREAT idea! Can’t wait to try!!! This is my first visit to your blog and this recipe has definitely convinced me that I need to do more exploring on your site, plus check out Shelley’s book! I’m a sucker for fall recipes and this sounds so delicious. This looks amazing! I cant wait to make it. I am so excited for pumpkin season and fall recipes! Isn’t it funny how life works. I have Shelly’s book but haven’t had a chance to look through it…but here I am, new to your blog, and saving this recipe to use tonight for the AM! I could use another copy of the book for my daughter for Christmas so please don’t pass me by. This recipe looks great! Thanks for the opportunity to win the book! Far healthier than a Pumpkin Spice Latte! This sounds amazing. I, for.some reason, even with soaking, cannot eat oats. I may try soaked brown rice instead. Thanks for the giveaway. Holistic recipes?! Sign me up! I am always on the hunt for healthy recipes and ones that help energize and increase immunity sound fab! I would love to tryout this recipe on myself & hopefully my 4 young kiddos would give it a go also =) It would be awesome to win the cookbook & add more healthy recipes to our lives. Every October, I vow to try to “embrace” oatmeal”. You might have inspired me, dear Winnie. Thanks for the tip about soaking oats. The recipe sounds amazing. Can’t wait to try it with my two little guys. My daughter and I are constantly looking for more holistic ways to tackle her chronic fatigue and resultant weight loss. This recipe certainly ticks the boxes – can’t wait to try it. This recipe looks great and now I am definitely interested in the book. Thanks for the chance. This is a wonderful opportunity to learn how to create healthy meals for my family. I love chai, I love oatmeal. The two together….yummy! I bet my husband would love this recipe for oatmeal. He loves his oatmeal. This looks so yummy! I love oatmeal and am always looking for a way to switch it up!! Yum! I was thinking just this morning that I need more yummy nourishing breakfasts for me and my kiddos. I learned something new! Thanks for the tip about soaking oats in lemon juice. I’m looking forward to this recipe. This oatmeal sounds and looks yummy! I can’t wait to try it. I never knew about soaking the oats. Do you use canned coconut milk or fresh carton coconut milk? Please enter me in the cookbook giveaway. Sounds wonderful. I wonder about the chai however. Is it just for the taste or the caffeine or both? Thanks for sharing. Intriguing recipe. Has me curious about the book! This looks delicious! I love that it is all natural foods! Can’t wait to make it! This recipe sounds great! It makes me look forward to those cool fall mornings! I have lived all my life (since age 3) with rheumatoid arthritis. treatments have always focused on medications but over the past several years I’ve been looking more closely at the relationship between food and my health. This book looks like the perfect addition to my “library”. Have to try this oatmeal! I love to add this book to my arsenal. And this one looks pretty kid friendly.. I’ll do roobios instead of chai though.. thanks! You had me at Chai & Pumpkin… looks delicious! I will definitely be giving this recipe a try over the weekend!! Pumpkin and Chai!!! Two of my favorite things. I will definitely be trying this recipe. This looks great. Can’t wait to try it. Can you answer a question, though? Is the coconut milk the creamy stuff in a can, or is this like coconut milk beverage in a carton similar to almond milk? Hi Charles, I recommend coconut milk in (BPA-free) cans. The coconut milk beverages are generally sweetened/more processed…I don’t use those. This is beautiful! I bet it smells just amazing! Pinned! This sounds absolutely delicious, and this cookbook sounds like what I’ve been looking for to help me find healthier foods that don’t clash with my medical condition. Giveaways are great for a poor graduate student like me, too. Thanks for sharing the recipe, thanks for you blog, and that’s for the chance to win! Chai is almost never vegan – it sounds amazing but if you are looking for a recipe for your vegan friend double check the chai before you dish it up. The recipe calls for a chai tea bag and coconut milk, so it is indeed vegan. Yes you are right. I read chai tea and tazo but missed the bag part. If you use a bag then it should be safe. I was super sad when I figured out chai tea at starbucks is off limits. Now that I realize there is a chai tea bag I will make this for sure. Thanks. Oh my goodness. This looks SO good! This will totally get me ready for fall! This looks lovely! Do you think it would keep well for a couple days? 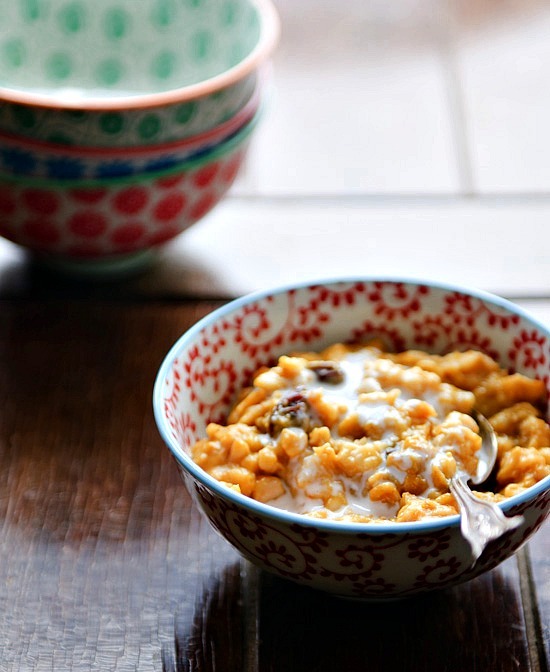 Could I make a batch over the weekend for weekday breakfasts? I find this recipe absolutely fascinating. I have the hardest time digesting oats. I am thinking your soaking technique may be the ticket for me. Do I do it on the counter or in the fridge? Just got back from an all-inclusive vacation in Jamaica and was served a different flavored oatmeal or porridge each day. All were scrumptious. This particular recipe is unique and differs from any previous oatmeal recipe I have ever encountered. I wonder though if steel cut oats could be used in place of rolled oats. Think I will follow the recipe as it stands for starters. After that I am going to experiment using steel cut oats. Steel cut oats have a lower glycemic index, other than that rolled oats are equal in nutritional value. As we age the pancreas begins showing signs of slowing down. I try to do whatever possible to extend the life of my pancreas and delay the onset of diabetes. Just in case I don’t win the book, I have already added it to my Amazon wish list. Since discovering 101 Cookbooks I covet more and more cookbooks. Why stop at one hundred and one!